This Carrot Hummus with Toasted Paprika Pita Chips is a perfect addition to any family summer picnic. 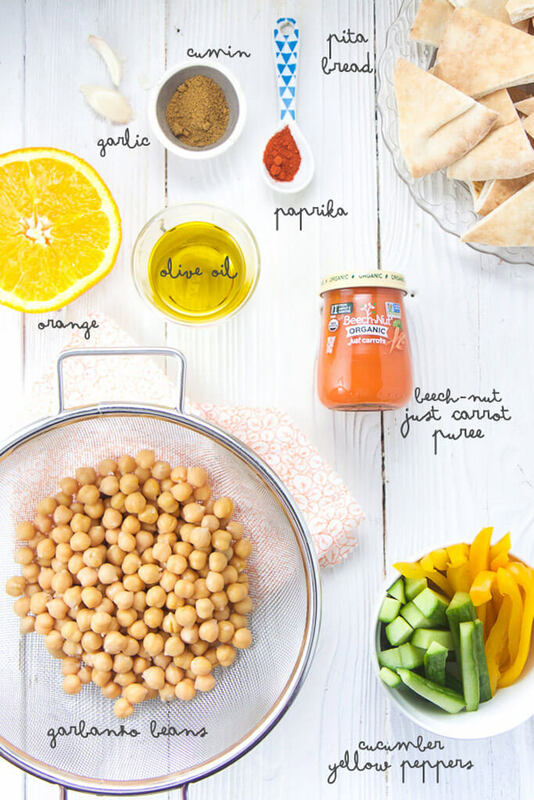 The Carrot Hummus is made with 7-simple ingredients and a jar of Beech-Nut just carrots purée, which makes for a flavorful, smooth and nutrient packed dip. Serve with crispy homemade spiced pita chips and a side of cut veggies and you have yourself a picnic winner! 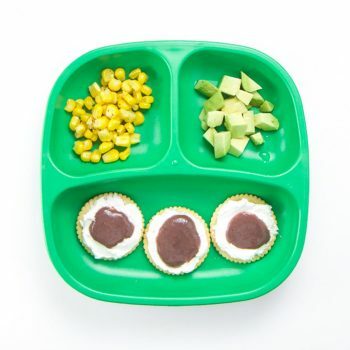 Keep in mind that several of the menu items mentioned in this post are best for children ages 4+, however the Carrot Hummus is baby-friendly and great for your LO aged 6 months+. It’s official – I’m a soccer mom. Granted, I might not be a very good one, but nevertheless I have acquired the official soccer badge. Since I wasn’t a soccer player growing up (softball and tennis were more my thing), I didn’t really know what to expect. So for Ellie’s first soccer practice, which we were of course running late for, not to mention that I didn’t even think about packing fancy folding chairs, a huge sports umbrella or even hoodies for when the weather decided to cloud over and rain on us. I have a lot to learn about being a soccer mom. But I did remember to bring the old blanket that I always have in the trunk of my car (which does have some questionable stains on it from surviving two babies/toddlers), and a cooler full of healthy picnic food for dinner. Ellie’s practices started at 5:15, so a picnic dinner on the field was going to be a requirement from both of the girls who normally eat at 5:30-on-the-dot. Don’t get me wrong, I was planning on packing a little ‘mommy’ beverage for the practice, but decided I should probably wait until at least the second practice for that. 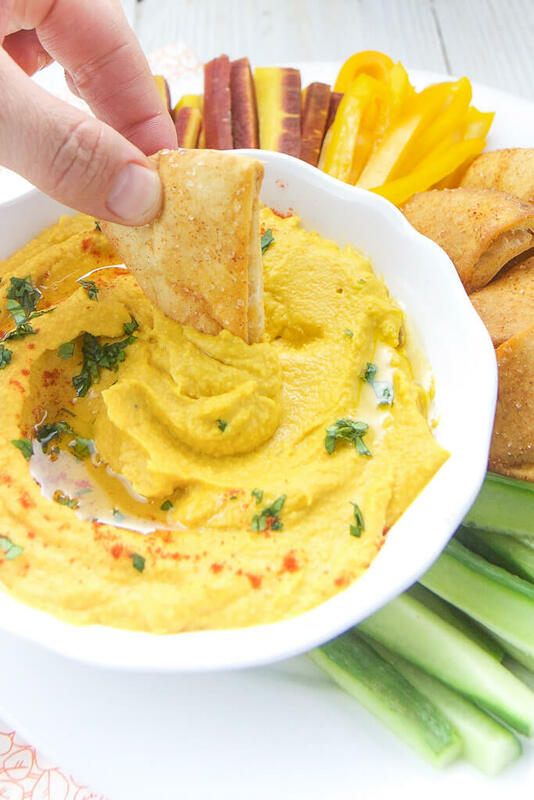 Let me just tell you, the Carrot Hummus and Toasted Paprika Pita Chips are definitely going to have to make an appearance at every soccer picnic, they were just SO good! The first thing Ellie did when soccer practice was over was not to run over for hugs or high-fives for doing so well at her first practice. Nope, she ran over, sat down and dived right into the hummus and pita chips. Food always comes first with that girl! With a 20 minute prep time for both the hummus and pita chips, it’s going to be easy to pack this healthy snack for all of our summer picnics. 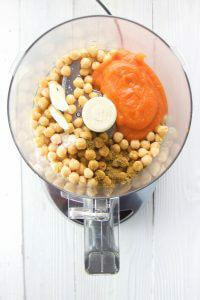 To make the Carrot Hummus, we start with the usual suspects – garbanzo beans, garlic, cumin and olive oil. But then we add in our top-secret ingredients that takes a boring plain hummus to a fantastically flavorful hummus – one (1) jar of Beech-Nut just carrots purée and a squeeze of fresh orange juice! 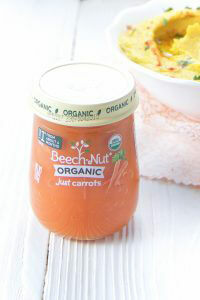 Adding in a jar of delicious Beech-Nut just carrots purée to the hummus not only gives it a huge flavor boost, but it also gives it a ton of extra nutrients. Paired with a big squeeze of orange juice, this hummus is rich and creamy with some depth from the carrots and a little zing from the orange juice. It’s a match made in heaven. And anytime I can add in extra veggies to a dish, you know I am going to. One thing I love about the Beech-Nut brand purées, and why it is my number #1 go-to brand of pre-made baby food, is that ALL of their products are made in the USA and sourced from the fresh produce close to their kitchen in Amsterdam, NY. Now, let’s talk about these Toasted Paprika Pita Chips, because when I posted a picture of them on Instagram, people went crazy trying to get the recipe. While I love to serve my hummus with a big colorful selection of chopped vegetables, I also love to add in some crunchy pita chips as well. Plus, they are so easy to make. 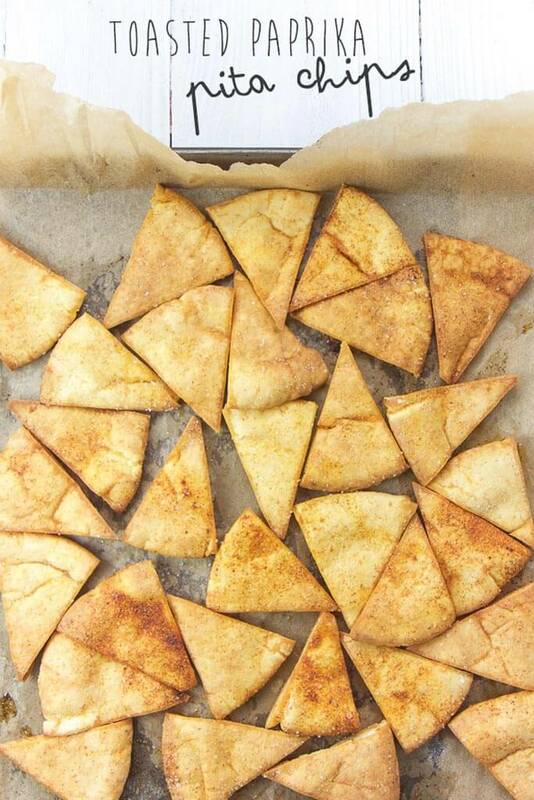 We cut a bunch of pita pockets into wedges, snuggle them all up on a baking sheet, the closer the better in this case, and brush them with a little olive oil and spice mixture. Our spice mixture, in this case, is paprika, garlic powder and onion powder. Then in the oven they go, until they are nice and crispy. Once you pull them out, it’s best to let them cool for 5-10 minutes before ‘taste testing’ them. For one, you won’t burn your mouth, but they will also crisp up as they cool down. 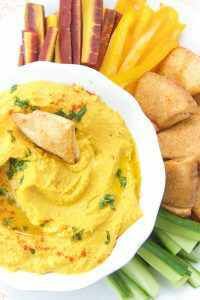 A healthy hummus that is full of flavor and nutrients – touchdown!! Wait. Wrong sport… GOALLLLLL! 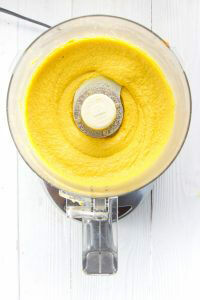 Note on purée: You can also use homemade carrot purée in this recipe, like this one. Note on salt: This hummus is perfect for babies 6+ months old, just omit the salt in their portion. 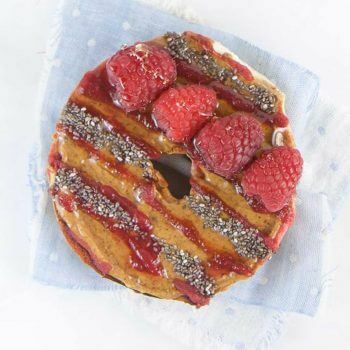 You can also use just a pinch of Himalayan Salt instead of sea salt, which has proven healthy benefits (read more here). Preheat oven to 375 degrees F. Spray or line a baking sheet. Cut the pita pockets into 8 wedges each and place on baking sheet. In a small bowl, whisk together the olive oil, paprika, garlic powder and onion powder. Generously brush the tops of the pita bread with the olive oil and sprinkle with salt. Bake the pita bread for 12-15 minutes or until golden brown. They will continue to crisp up as they cool. 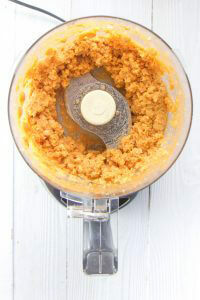 Meanwhile, in a food processor or blender, add in the garbanzo beans, carrot purée, orange juice, garlic, cumin and salt and pulse until just combined. Turn machine on and drizzle the olive oil into the mixture. 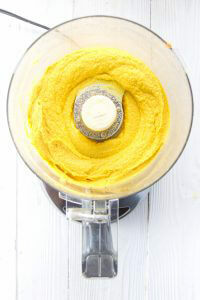 For a smooth hummus, blend for 1-2 minutes on high speed. Spoon hummus into a bowl, sprinkle with paprika and chopped parsley (optional). Place pita chips and cut veggies onto a plate and serve.